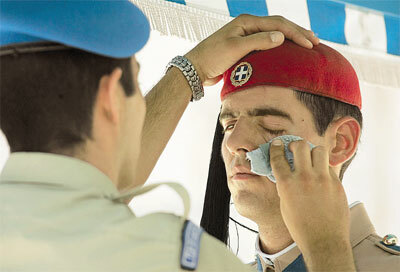 A soldier wipes the face of an evzone, who is not allowed to move as long as he remains on guard, outside Parliament in central Athens, yesterday. The temperature rose to around 40C (104F) yesterday in a heat wave that is expected to continue over the next few days. The City of Athens and the Athens-Piraeus Prefecture have opened doors to many of their air-conditioned facilities to locals looking for a place to cool off. More information is available on 1539. The National Meteorological Service (EMY) said there will be little relief from the heat before Wednesday.